When I moved to Thailand at the end of September 1999 to develop travel company, Smiling Albino (SA), I couldn’t wait to hit a beach. Originally from Calgary, Canada, we don’t exactly have a lot of tropical sand or ocean there and it was top of my list to hit one as soon as possible. I think the first beach I made it to was Ko Tao, an island located in the Gulf of Thailand, a short journey north of Ko Samui, famous for its scuba diving. It couldn’t have been long in to 2000 when I first journeyed further south to the western Andaman side of the kingdom and made my way to Ao Nang, a small, charming beach town in Krabi province. 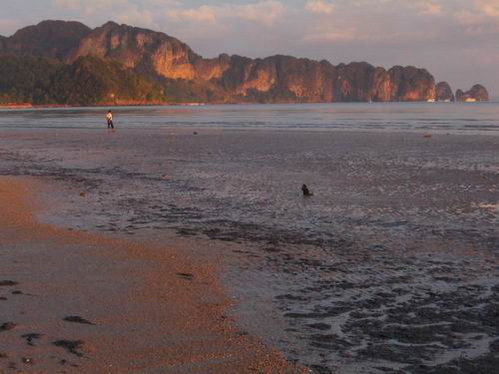 The area is famous for its limestone cliffs that rise dramatically to the sky and nearby Railay Bay where climbers dangle from cliffs also rising from the ocean. It’s gorgeous. 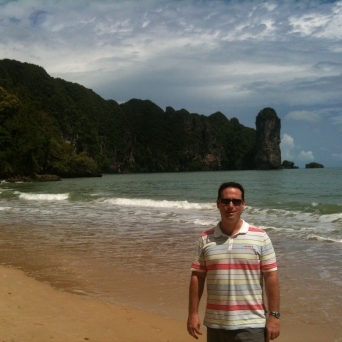 I’m not sure exactly how or why I ended up heading to Ao Nang, but quickly fell in love, we made it one of our original beach destinations on SA trips, and I ended up down there at least three times per year. As business grew and we passed about 2006, other people in the company were tasked with being responsible for the area; I sadly didn’t get to go very often and suddenly years were passing between visits. Small shops selling 50 Baht ($1.75US) plates of food made a trip relatively inexpensive, most restaurants were small mom-and-pop ones and then McDonald’s and Starbucks came. I feared my beloved beach area would be forever spoiled and soon have high-rises, umbrellas blanketing the beaches and jet skis blazing and blaring across the sea. I made it down a couple times from 2007-2011 and while some more modern looking restaurants and shops had opened, things were still pretty sleepy, no high rises were in sight and mass development had not yet arrived. Fast forward to July 2012 and I again was a bit apprehensive as to what I would find while scouting the area for my upcoming November 2012 wedding. I’d heard that things had really changed from friends and almost expected the worst. First night there my fiancé and I strolled the main tourist strip and I was relieved and pleasantly surprised. While old-hands in the area will say how it’s grown, Ao Nang is still extremely small and charming compared to places like Phuket and Ko Samui. There are no high rise complexes, only a few go-go bars (which are pretty well hidden) and growth has only gone out another half kilometer or so further out the main roads. Most importantly the people smile and are for the most part genuinely friendly. There are signs of change, growth and possibly busier times to come though. There are a lot of foreign Asians working in front of shops and restaurants with the task of getting people in the door which is starting to create a running-the-gauntlet feel to strolling around. Many shops have been renovated and are aesthetically nicer, but prices have noticeably gone up. Some small family-run establishments are now gone and are clearly owned by larger business entities. Few things in life go unchanged and this is even truer in the world of travel. Quiet, undiscovered locations slowly become found, word gets out, services are built, more people show up and then its spoiled for those whose first impression was the ‘good old days’. 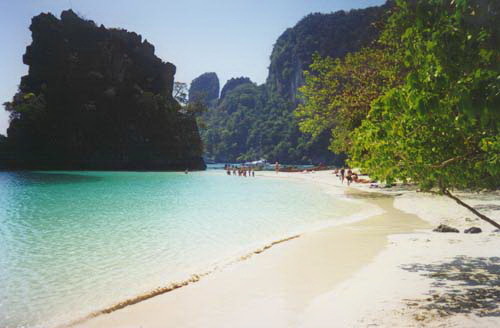 That said, Ao Nang still retains a nice, personal feel, is good value for money and staggeringly gorgeous. I can’t wait for my wedding!